What Will Writing Look Like in 2019? Identifying change is a difficult thing when you’re looking through a microscope at a sliver in time. But if you think back to five or ten years ago and focus your attention on technological developments that have shifted the way we communicate, you can start to see the impact of those advances. Last year was the year of AI, often referred to as machine learning. It brought with it smart replies and smarter AI that enabled the creation of more sophisticated writing-tech features. That will only increase over the next year, experts say, as companies and industries continue to buy into the technology. “There are so many ways to use AI, it’s almost impossible to describe its role: it can be a writer, a planner, a data analyst, and so much more. AI can help marketers interpret all of their data and put together better content marketing strategies,” says Lilach Bullock, an online business expert, and coach whose reporting has focused on the relationship between AI and content marketing. “I think we’ll see an even bigger impact of artificial intelligence on this type of [writing] tech, which I think can have both amazingly useful and dangerous implications in the near future. AI will help us write better and faster but it could also simply…write it all for us: blogs, news, and probably even books,” she says. A few examples of the kind of AI innovations that might exist are things like suggesting the statistically best subject lines for emails, calculating the best time of day to send those out, automatically highlighting questions or calls to action, creating better text summaries, or even suggesting topics for your blog. “Work hard” has already been replaced by “work smart.” And as global economies shift, it’s a trend that will likely continue, says Grammarly co-founder Max Lytvyn. “Employment levels are quite high, so you have to make current people more productive . . . And it’s becoming more and more of a focus as unemployment drops in other economies outside of North America as well,” he says. The real-world translation of increased productivity will likely mean more automation of basic functions that will allow workers to get to the meat of their work, thereby accomplishing more in a shorter timeframe. This push for productivity could also mean a move toward the separation of the work sphere and the real-life sphere. Whereas early adopters of new tech are often the first to realize the potential issues that those tools enable, recognizing those issues makes it easier to fix them. This would, ideally, make it easier to achieve work-life balance, and it would alleviate some of the issues that social media platforms have created. For example, in the early days of Facebook, the idea of adding your coworkers and family and friends to one platform didn’t necessarily raise the red flags it might today. But rather than requiring separate platforms for work, life and family, Facebook added a “specific friends” option that made it easier to decide who sees any given post. That kind of separation will likely continue to improve in 2019. At a basic level, machine learning or AI is an automatic model that can be replicated ad infinitum. But once you have those basics down, there’s usually room for improvement. After all, even the most basic concept can be complicated, given the right set of conditions. In some cases, that will mean teaching AI common-sense information to fill in the gaps. 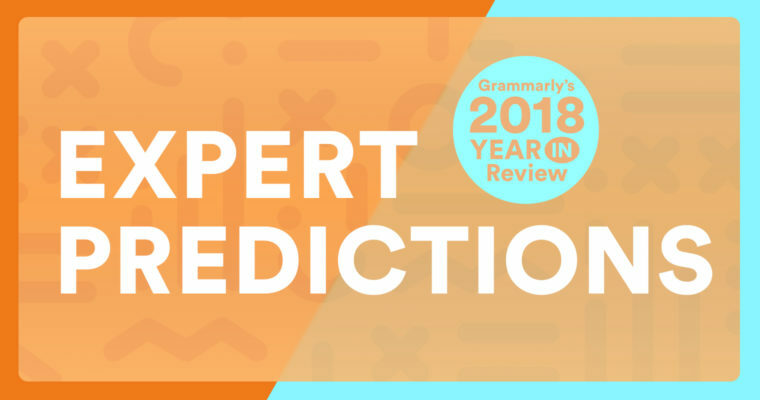 “I think another big trend will be including more and more real-world knowledge in these automatic models which will then help enrich the type of processing that we’re able to do, and providing more and better types of suggestions as far as how to rewrite text and how to generate messages,” says Grammarly research scientist Courtney Napoles. One example of this is the idea that the sky is cloudy when it rains. Of course, common knowledge says it’s true—you need clouds to produce rain, so they must be there when it’s raining. But for an algorithm, it’s something that must be taught. This past year’s AI trends tended to focus on convenience. And while that often creates easy-to-use tools, it can also create fewer opportunities, and less incentive, to write. Going forward, that will likely be just as true, especially when considering the opportunities to write outside of work. But the importance of writing will not diminish—it will still be an integral part of life and work, she explains. “What I worry about is that we are putting less and less emphasis on really thinking about what you write. We’re writing increasingly more on smartphones, and writing less. So caring about mots justes, playing with syntax, and editing what we say are going to be lost arts, which disenfranchises us as human beings,” says Dr. Baron. The future of writing technology is, as of now, a bit of an open book. Almost anything can happen, given the right circumstances, the right technology, and the right buy-in, as Paul Roetzer, founder of the Marketing Artificial Intelligence Institute, notes. “We can kind of rewrite the future of how marketing functions with all this new technology, but the crazy part is that no one understands that and people are afraid of it, or it’s so abstract to them that they just kind of want to wait and see . . . People are just kind of sitting on the sidelines of what might end up being the most transformational thing we see in our lifetime in marketing,” he says. Ultimately, communication changes at the rate that people are willing to adopt new technologies. So the biggest changes probably won’t happen overnight. In fact, progress will likely feel incremental over the next 12 months, says Grammarly co-founder Lytvyn. Even so, there’s still reason to be optimistic, especially when you employ a more long-term perspective. “Technology is progressing very quickly and it’s just amazing how the things we didn’t think were possible a few years ago are possible now,” he says.